Vancouver, British Columbia - Velocity Minerals Ltd. (TSXV: VLC) (“Velocity” or the “Company”) announces that it has entered into a binding letter agreement (the "Agreement") with current partner Gorubso Kardzhali A.D. (“Gorubso”) to substantially expand the scope of its relationship with Gorubso. The Agreement sets out the terms by which Velocity and Gorubso will form an exploration and mining alliance (the “Alliance”) covering all existing and future Gorubso and Velocity projects (the “Projects”) within an area of 10,400km2(the “Alliance Area”) (Figure 1) covering the prospective Eastern Rhodope Gold Mining District in southeastern Bulgaria. EXPLORATION AND MINING ALLIANCE -- The Agreement contemplates the exploration, development, and mining, as applicable, of the Projects and provides for an option/joint venture mechanism by which Velocity and Gorubso will partner to maximize value for both parties. ACCESS TO GOLD PROCESSING PLANT -- Gorubso will make its central gold processing plant available to all Projects to process all future mined material as necessary. Securing use of the processing plant provides Velocity and the Alliance with reduced project risk, as well as potential capital and time savings. OPTION FOR 50% INTEREST AT OPERATING CHALA MINE -- Upon reaching $1 million in exploration expenditures at Gorubso's Chala gold mine (the "Chala Mine"), Velocity will have an option to acquire a 50% beneficial interest in the Chala Mine and to form a joint venture with Gorubso for the further development and expansion of the mine. EXCLUSIVITY ON OTHER GORUBSO PROPERTIES -- Velocity will have an opportunity to complete option agreements on all Gorubso Projects, whereby it can earn a 70% interest in the Projects on similar terms to the current option for the advanced Rozino gold project. 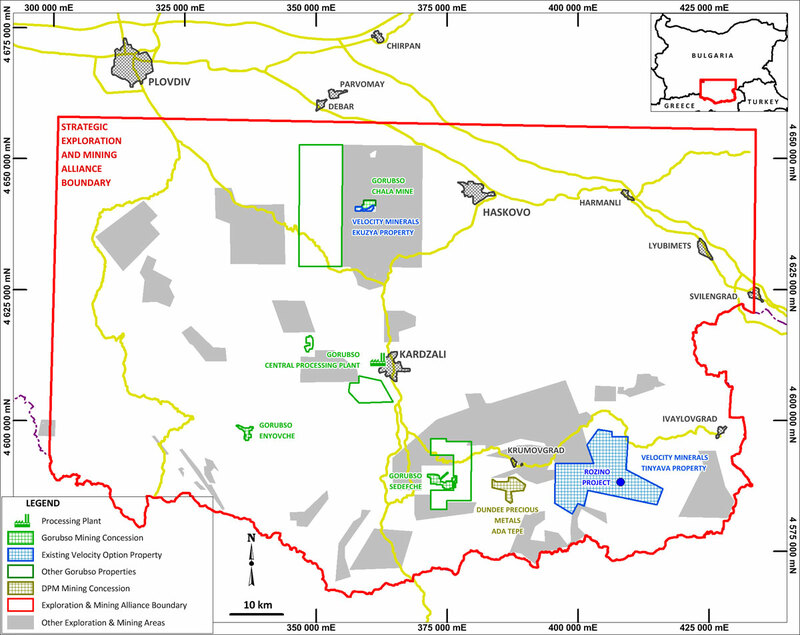 Figure 1: Map illustrating the Exploration and Mining Alliance Boundary and the exploration and mining projects currently located within it. Projects immediately impacted by the Alliance are Velocity Projects shown in blue and Gorubso Projects shown in green. Gorubso owns and operates a modern gold processing plant (the “Plant”), which provides crushing, grinding, gravity, carbon-in-leach, elution, electro-winning and gold dore production facilities. The Plant is centrally located within the Alliance Area. Under the terms of the Agreement, Gorubso will make the Plant available for the processing of mineralized material from current and future Projects. Material processed by the Alliance at the Plant will be processed on a cost-plus basis. Securing the use of the Plant provides significant technical and financial risk reduction, as well as potential capital and time savings. Most importantly, securing the use of the processing facility significantly reduces permitting risk and time that might otherwise arise if a processing plant had to be permitted and built prior to mine construction. The use of the Plant is being considered as one option for the preliminary economic assessment (the “PEA”) being completed for Velocity’s Rozino project where the Company intends to assess the possibility of producing a low-volume concentrate through flash-flotation on site and transporting a concentrate to the Plant for vat leaching and gold recovery. There are no assurances that such assessment will produce positive economic results or that such results, even if possible, will be included in the final PEA. elect to receive a 5% gross smelter royalty on resources discovered directly or indirectly through Velocity’s exploration efforts. The Chala Option will be governed by a separate option agreement, which is expected to be negotiated by the parties in the coming weeks. Historical resources at the Chala Mine are reported as 1.5Mt @ 9.83 g/t gold (450,000oz). The historical resources were published by Kestebekov C, 1998, in “Chala gold-polymetallic deposit, Spahievo ore field. Results of 1983-1997 geological exploration with estimated resources of gold and gold-polymetallic ores as of 01/01/1998”. Total historical production at the Chala Mine is estimated to be approximately 120,000 oz. The historical resource estimate was produced using the Bulgarian classification scheme, based on manual polygonal methods of resource classification. A qualified person has not done sufficient work to classify the historical estimate as current mineral resources or mineral reserves. In order to verify the potential existence of additional unmined mineralization at the Chala Mine, significant drilling will be required. The Company is not treating the historical resources as current mineral resources or mineral reserves. Historical resources are not consistent with the standards of disclosure defined by National Instrument 43-101 Standards of Disclosure for Mineral Projects (“NI 43-101”) and may not necessarily be consistent with CIM (Canadian Institute of Mining, Metallurgy and Petroleum) best practice with respect to reporting mineral resources and reserves. Historical resources are included because they are considered relevant by the Company as they provide additional support for the potential exploration drilling at the Chala Mine by Velocity. The inclusion of historical resource estimations provides information as to the potential size and nature of the immediate exploration targets in the vicinity of the Chala Mine. There are no more recent, published historical resources available for the Chala Mine. Over the past 10 months, Velocity has completed extensive due diligence and resource targeting at the Chala Mine and has identified multiple high-priority targets adjacent to or below existing mine infrastructure. Velocity has digitally captured all available paper datasets at Chala, including, 20,798m of surface trenching, 55 historical surface drill holes, all existing underground development and production stopes including details of underground sampling within 31,664m of exploration and mine development and face sampling within 657 mining stopes. 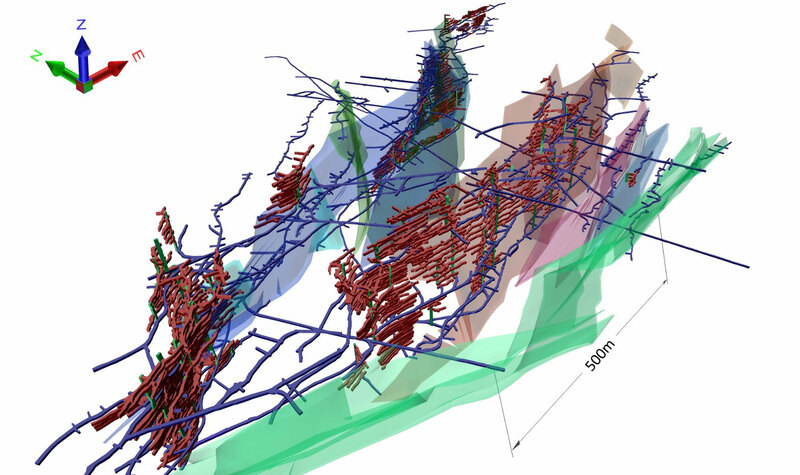 The resulting data set allowed Velocity to build a comprehensive 3D geological model (Figure 2), which was then used to generate priority drill targets. Velocity has hired a mining engineer with extensive gold mining experience in Bulgaria and Russia, having over 10 years’ experience at Dundee Precious Metals’ Chelopech gold mine in Bulgaria and most recently at Kinross’ Kupol gold mine in Russia, where he was responsible for both short and long-term mine planning. Figure 2: 3D View of the Chala Gold Mine Exploration Model, viewing northeast. Development in blue, with stope sampling shown in red. Vein wireframes are represented in transparent colours. Under the terms of the Agreement and subject to any applicable regulatory and stock exchange approvals, Velocity will have the exclusive option to earn an undivided 70% interest in all existing and future Gorubso properties (the “Gorubso Properties”) located within the Alliance Area, with the exception of the Chala Mine which is dealt with separately. The existing Gorubso Properties are summarized in Table 1 below. Depending on how advanced the particular property is, the associated option is exercisable by Velocity by the delivery of either a mineral resource estimate (for grass roots properties), a PEA (for advanced exploration properties) or a feasibility study (for properties with a mining concession). Velocity is currently earning-in on its option to acquire a 70% interest in the Tintyava prospecting licence, and is completing extensive diamond drilling at the advanced Rozino gold deposit located on the Tintyava prospecting licence area. Before electing to option any additional Gorubso Properties, the Company will complete extensive due diligence. This process is underway and is close to completion at the Sedefche gold deposit, where Velocity has completed internal resource estimation and pit optimization in preparation for exploration drill planning. Tintyava (Rozino) Prospecting Licence 51 7.7Mt @ 1.24g/t gold (307,000 oz) at 0.6g/t cut-off. Sedefche Mining Concession 28 101,000 oz Resource. Makedontsi Prospecting Licence 6 290,000 oz Resource. Table 1: Summary of Gorubso Properties, including the Rozino deposit, which Velocity is currently drilling. Project locations are illustrated on Figure 1. Note 1: Historical resources at Rozino are unconstrained Inverse Distance Squared resources published by Hereward Resources Ltd. (Hereward Resources news release, 2005). Velocity has completed 7,000m of diamond drilling (2017) and intends to complete an additional 5,000m of drilling prior to producing a PEA (2018). Note 2: Historical resources at Sedefche were calculated by Gorubso using the Bulgarian classification scheme, based on manual polygonal methods of resource estimation. Resources were submitted to and accepted by the Bulgarian government, Dragiev, H, 2006, “Momchil Prospecting License, Report at the ‘Zvezdel - Pcheloyad Ore Field’, Geological Report with Resource And Reserve Recalculation of ‘Au-Ag Ores’ at the Sedefche Deposit”. In order to verify the potential existence of additional unmined mineralization at Sedefche, significant drilling will be required. Note 3: Historical resources at Makedontsi were calculated by Gorubso using the Bulgarian classification scheme, based on manual polygonal methods of resource classification. Resources were submitted to and accepted by the Bulgarian government, Dragiev H, 2013 "Mlechino Prospecting License, Geological Report at the Nadezhda Prospect, with Resource and Reserve Recalculations of ‘Au Ores’ at the Makedontsi, Dangovo and Kalina deposits”. In order to verify the potential existence of additional unmined mineralization at Makedontsi, significant drilling will be required. The Company is not treating the historical resources referenced in Table 1, Note 1, Note 2, and Note 3 as current mineral resources or mineral reserves. Historical resources are not consistent with the standards of disclosure defined by NI 43-101 and may not necessarily be consistent with CIM best practice with respect to reporting mineral resources and reserves. Historical resources are included because they are considered relevant by the Company as they form additional support for the potential optioning of the Gorubso Properties by Velocity. At Rozino, resources were later completed by Maine Reserves Associates (USA) on behalf of Caracal. These resources are calculated assuming underground mining methods and are not considered relevant to Velocity’s potentially surface mineable targets. Additional details on historical estimates at Rozino are detailed in “National Instrument 43-101 Technical report for the Rozino Project, Republic of Bulgaria” (2017). A qualified person has not done sufficient work to classify the historical estimate as current mineral resources or mineral reserves. The inclusion of historical resource estimations provides information as to the potential size and nature of the immediate exploration targets within the Gorubso Properties and the Alliance Area in general. The technical content of this news release has been approved for disclosure by Stuart A. Mills, BSc, MSc, CGeol, a Qualified Person as defined by NI 43-101 and the Company’s Vice President Exploration. Mr. Mills is not independent of the Company. CAUTIONARY STATEMENT REGARDING FORWARD-LOOKING INFORMATION: This news release contains forward-looking statements and forward-looking information (collectively, “forward-looking statements”) within the meaning of applicable Canadian and U.S. securities legislation, including the United States Private Securities Litigation Reform Act of 1995. All statements, other than statements of historical fact, included herein including, without limitation, statements regarding the negotiation and exercise of an option agreement for the Chala Mine and the other Gorubso Properties, the exercise of the Company’s option for the Tintyava prospecting licence, the anticipated content, commencement, timing and costs of the recommended exploration program on the Gorubso Projects and the Tintyava/Rozino project and exploration program results from same, the Company’s expectation that it will be able to enter into agreements to acquire interests in additional mineral properties, the discovery and delineation of mineral deposits/resources/reserves on the Gorubso Projects (including the Chala Mine) and the Tintyava/Rozino project, and the anticipated business plans and timing of future activities of the Company, are forward-looking statements. Although the Company believes that such statements are reasonable, it can give no assurance that such expectations will prove to be correct. Forward-looking statements are typically identified by words such as: “believe”, “expect”, “anticipate”, “intend”, “estimate”, “postulate” and similar expressions, or are those, which, by their nature, refer to future events. The Company cautions investors that any forward-looking statements by the Company are not guarantees of future results or performance, and that actual results may differ materially from those in forward-looking statements as a result of various factors, including, operating and technical difficulties in connection with mineral exploration and development activities, actual results of exploration activities, the estimation or realization of mineral reserves and mineral resources, the timing and amount of estimated future production, the costs of production, capital expenditures, the costs and timing of the development of new deposits, requirements for additional capital, future prices of gold and precious metals, changes in general economic conditions, changes in the financial markets and in the demand and market price for commodities, accidents, labour disputes and other risks of the mining industry, delays in obtaining governmental approvals, permits or financing or in the completion of development or construction activities, changes in laws, regulations and policies affecting mining operations, title disputes, the inability of the Company to obtain any necessary permits, consents, approvals or authorizations, TSX Venture Exchange acceptance of any current or future property acquisitions or financings and other planned activities, the timing and possible outcome of any pending litigation, environmental issues and liabilities, and risks related to joint venture operations, and other risks and uncertainties disclosed in the Company’s latest Management’s Discussion and Analysis and filed with certain securities commissions in Canada. All of the Company’s Canadian public disclosure filings may be accessed via www.sedar.com and readers are urged to review these materials, including the technical reports filed with respect to the Company’s mineral properties.